Our templates are well known for their easy to use layout. First, choose a template design from any of our categories. Purchase it online or by phone and download it right to your computer. Open the template in Microsoft Word, Publisher, or Apple iWork Pages and customize it to suit your needs. Then, print your finished project on your own printer or send it out to a copy center/office supply store. Use your template as many times as you like! Here's a closer look what you'll find inside all our template layouts. In this example, we are displaying our large tabloid booklet Adoration Template. The Funeral Program Site's professionally-designed templates make it easy to create great looking memorial and funeral programs affordably and quickly. Our templates include one customizable design in Microsoft Word, Publisher, or Apple iWork Pages file, high quality background images and are produced to exacting technical standards suitable for printing on color laser or inkjet printers. The Funeral Program Site offers creative memorials for brochures, gatefolds, graduated folds, booklets, flyers, cards, postcards, invitations, bookmarks, pet memorials, prayer and thank you cards used by families and businesses. If you're faced with time and creative limitations and budget constraints or simply need new creative ideas, let our designs do the work for you. Why recreate the wheel when you don't have to? Create your own beautiful memorial as a final tribute for your loved one. Produce impressive-looking brochures, flyers, postcards and bookmarks for a keepsake. Save time with our easy to follow layout and preset photo and text boxes. Use our template designs to enhance or further your business. Use your own office tools to produce and print finished designs in-house within minutes. 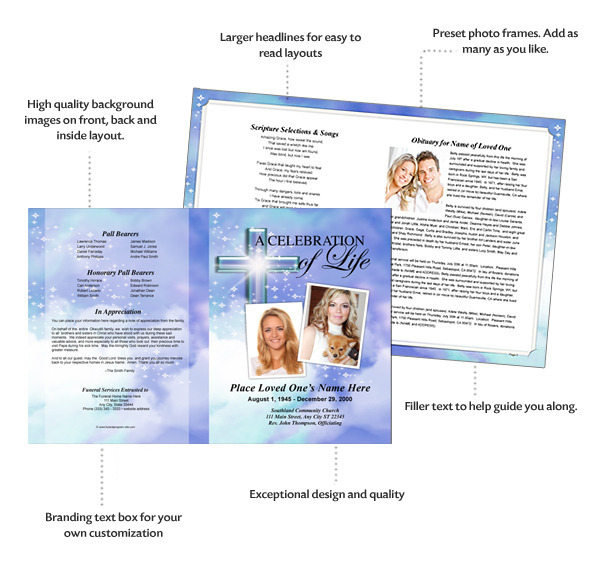 High quality template and design backgrounds for creating funeral program brochures, gatefolds, graduated folds, booklets, flyers, cards, postcards, invitations, bookmarks, pet memorials, prayer and thank you cards. Complete, pre-designed layouts on front, back and inside of program with beautiful high resolution artwork. Ready to edit and print! Editable layout and graphics file to insert photos and personalized text to create unique programs of your own. Complete design sets for creating a consistent theme for all memorial keepsakes you want to distribute. Suitable for printing on inkjet and toner-based color home, office and commercial printers. Available for both U.S. and International pages sizes for immediate download with live customer support. Created and produced by our special team of graphic designers and illustrators. The Funeral Program Site caters to a variety of businesses in in the death care industry, printers, and families throughout the world. You get more than just a cover. The Funeral Program Site templates include high-quality high resolution for the front, back and inside designs for a complete presentation. All images can be used or removed as you desire. You will be able to edit all text boxes and photo boxes within our templates. To change up the front cover title, simply delete our title image and create a text box writing your own special title. You must use your own fonts from the computer you are editing the template. The templates are meticulously created and tested to ensure trouble-free print output and a high-quality finished product. Access our design template library anytime, anywhere from your computer’s browser. You will need to have the following software installed on your MAC or Windows computer to edit our templates. All files are in their native application .doc, .pub. or .pages.